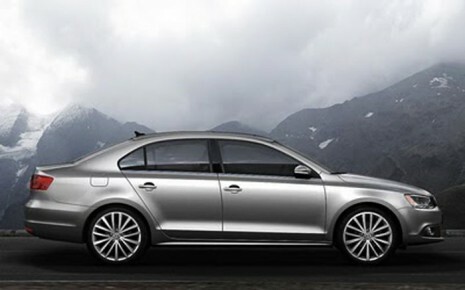 The 2012 Volkswagen Jetta GLI Review: The Jetta has always been kind of a cool car to drive and own. In a sea of Hondas and Toyotas, it delivers German engineering and a sportier feel. So, when I read about the new Jetta four-door sedan I was a little concerned. There were comments in the automotive press about "cheaper plastic" in the interior and the external design language seemed a little simplified. But before long, new Jettas started appearing everywhere I looked. As it turns out, the new Jetta is a success. I had the opportunity to pilot a Jetta GLI recently. It earns its distinctive three-letter badge by featuring a 2.0-liter TSI turbocharged engine under the hood that's good for a robust 200 horsepower and 207 lb.-ft. of torque. That's like the one in my wife's Audi A4, and it's plenty potent in a car this size. This is a vehicle you can still get with a manual transmission, in this case a six-speed. The DSG automatic shifts very quickly, but there's nothing quite like a manual, at least for me. Fuel economy numbers are 24 City, 32 Highway, but I mysteriously averaged 23.4 mpg. Green numbers are very good. with an excellent 9 for Air Pollution and 6 for Greenhouse Gas. All Jettas earn EPA SmartWay status. Besides the GLI’s turbo four, the 2012 Jetta line-up features three other engine choices, including a gasoline 2.0-liter inline four-cylinder, 2.5-liter inline five-cylinder, and the 2.0-liter TDI® Clean Diesel. The 2.0-liter gas engine comes only in the base S model and provides a modest 115 horsepower and 125 lb.-ft. of torque. You can choose a five-speed manual or a six-speed automatic. The 2.5-liter inline five comes in the mid- and upper-level SE and SEL models, and jumps to 170 horsepower and 177 lb.-ft. of torque, with the same transmission options. The TDI Diesel model’s 2.0-liter engine churns out just 140 horsepower but a whopping 236 lb.-ft. of torque. With either the standard six-speed manual transmission or the DSG automatic, the TDI earns EPA average estimates of 30 mpg in the city and 42 mpg on the highway, with a range of more than 600 miles per tank. Getting back to the sporty GLI, its track-tuned independent suspension includes a multilink rear setup, re-tuned spring and damper settings and a 0.6-inch lower ride height. Volkswagen’s XDS® cross differential system, which debuted on the GTI, is standard on the Jetta GLI. It helps prevent inside wheel spin during hard cornering. As the performance-oriented Jetta since 1984, the GLI wears more aggressive clothes than its siblings. It's decked out in a new honeycomb grille, flaunts a more pronounced front spoiler and gets vertical fog lights like the ones on the GTI hatchback. Yes, those are red brake calipers tucked behind those shiny wheels. Inside, the car still feels like a VW. Of course, there's that unique logo at the center of the wheel, but the no-nonsense, angular dash surface, padded in this case, still seems like it should. The gauges tell you what you want to know with a minimum of fuss, a welcome feeling in this age when so many compact cars are giving you the shiny cell phone look. Side-bolstered sport bucket seats feature bright-red stitching. There’s matching red stitching on the flat-bottom steering wheel, and you get aluminum pedals, shift knob, dash and door trim. The Autobahn model, the upper level GLI, offers an upgrade to 18-inch wheels and a Fender audio system. I was not as impressed by the sound as by the distinctive Fender logos on the windshield-pillar-mounted tweeters, but it may be because I insisted on playing oldies instead of new stuff from my iPod. The new Jetta was specially designed for the U.S, its largest market. So the wheelbase is stretched to 104.4 inches, giving plenty of legroom for Americans, who demand it. Also, the trunk capacity, at 15.7 cubic feet, leads the compact sedan class. Drop the 60/40 split rear seats for larger objects, or use the small pass-through for carrying skis, pipes and what have you. Prices start at $24,515 for the base GLI, but by the time you move up to the Autobahn model with the navigation system, you're looking at $27,465. The base S model with manual transmission starts at just $17,415 and all prices include the $770 shipping charge.